The background of Godfrey Nims of Deerfield, Massachusetts, common ancestor of those with the name of Nims, is shrouded in mystery. One family tradition has it that he was a Huguenot, came to America as a lad, at first spelled his name Godefroi de Nismes, but changed the spelling to suit the colonial pronunciation. Yet some support is also available to suggest he was of English birth, though perhaps with French ancestry. No documentary evidence has been found to verify any country of origin despite efforts made over the years. In 1677, Godfrey married Mary Miller Williams, widow of Zebediah Williams who had been killed earlier by Indians. Following the death of Mary in 1688, Godfrey married Mehitable Smead Hull in 1692, widow of Jeremiah Hull. He had six children with Mary and five with Mehitable, in addition to caring for two stepchildren each that the widows brought to the marriages. As the records demonstrate, Godfrey Nims joined the Puritan society in the Connecticut Valley, learned to make his living as a cordwainer (shoemaker) as well as a farmer, and raised a large family. Like other settlers, he shared the work and faced tragedies and dangers common to the area. The greatest blow came on February 29, 1704, when about 2 hours before day "ye French & Indian enemy made an attaque upon Derefield, entering ye Fort with Little discovery though it is sd ye watch shot of a gun & cryed Arm, weth verry few heard." The attackers burned most buildings and killed or took captive most of the settlers. Godfrey died within a year, and it is from the four surviving children, John, Ebenezer, Thankful and Abigail, that members of the Nims family are descended. Below is a portion of The Story of Godfrey Nims translated to French by Lise Rochette-Menard. 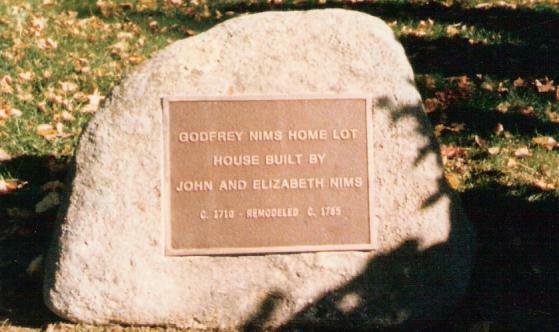 Les antécédents de Godfrey Nims de Deerfield, Massachusetts, ancêtre commun de la famille Nims, sont entourés de mystère. Une des hypothéses soutient qu’il était un Huguenot venu en Amérique alors qu’il était encore un tout jeune homme. Initialement, il aurait orthographié son nom godefroi de Nîmes, mais il en changea l’orthographe plus tard pour tenir compte de la pronunciation faite de son nom dans la Nouvelle-Angleterre coloniale. Une autre hypothése soutient qu’il était naissance anglaise, mais peut-être avec une ascendance française. Aucune preve documentaire n’a été trouvée pour identifier son pays d’origine, malgré les nombreux efforts déployés au cours de ans. Quel que soit son lieu de naissance, la première fois, mention officielle de Godfrey Nims apparaît le 24 septembre 1667, dans les archives de la Cour à Springfield Massachusetts. 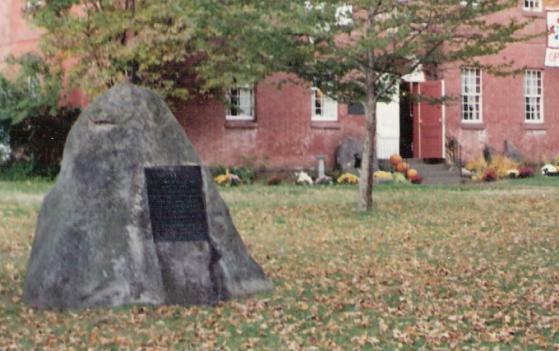 John Nims stone in front of the Nims House on the Main Street, a home now owned by Deerfield Academy.